For many years, Sr Florence Tsabedze, born in Eswatini (Good Shepherd Parish) and a member of the Franciscan Hospitaller Sisters of the Immaculate Conception has been serving in Mozambique. 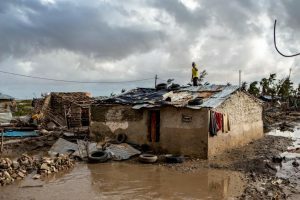 In the last few days she shared with me: “Concerning the needs, basically we need food, clothes, medical care… The bishop’s house in Beira, the Cathedral, mission, convent, outstations and many more shelters have been badly damaged, apart from the simple homesteads. Here the situation is worse because people are still dying of cholera and malaria caused by the cyclone. Dead bodies are still found in the seashore…”. I would like to invite everyone in our diocese to prove ourselves neighbours to them by showing compassion (cf. Lk 10: 36 – 37) as we read in the parable of the Good Samaritan. We will concentrate our efforts in Mozambique. Caritas Swaziland will collect any type of donations which will be channelled to “Caritas Mozambique” and “St Egidio” (with whom we partner also here in Eswatini). I ask every parish to be a centre where donations in kind are received. Each donation must be registered. Soon after our Easter celebration, a report of donations received will be sent to all the parishes.